It’s cold and there’s a snow storm going on, but those of us who grow food know the process of growing it needs to get started early with some plants. 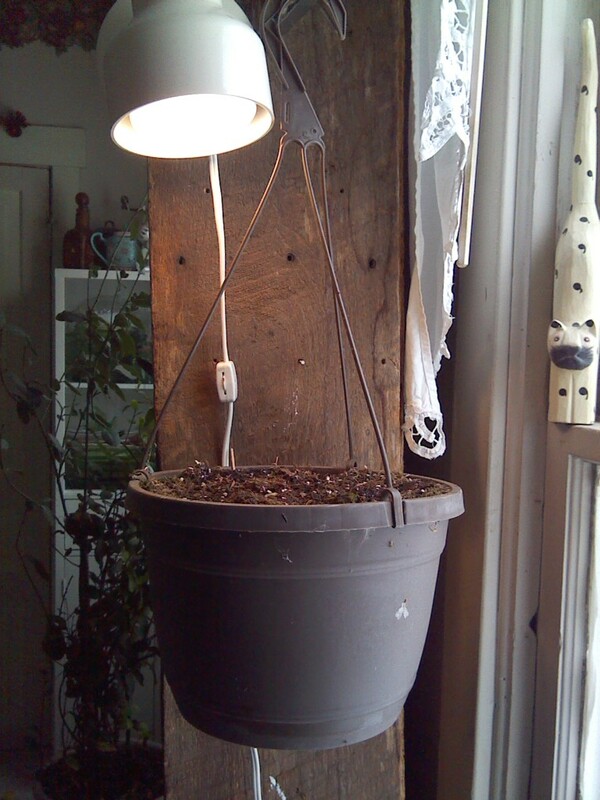 The moon is waxing, I’ve got good soil in a pot, and an east facing window and a plant light to help seedlings along. But tomatoes and peppers take longer to get established and unless you want to wait till August here to start to harvest, they are better started inside. I use only heirloom plants so seeds can be saved and the new plants produce the same quality and quantity every time. Also, with no genetic modification, I know exactly what I’m growing, and eating. In the pot are: beefsteak tomato, Roma, a couple chilies and a couple jalapenos. They only take up 2/3 of the pot, leaving room for two more kinds of seeds. My son’s fiance (they are engaged and I’m tickled pink!) has two kinds of seeds ordered from a guy she works with. About Eliza, I guess I should say I’m tickled purple instead of pink, cos she has a thing about purple. Here’s a previous blog about a quest to get some seeds for beans she wants to grow, and I’m looking forward to that experience myself. https://sarasinart.net/2014/09/26/thai-purple-podded-yard-long-beans/ We’ll grow those, as well as my other regular beans, on tepee supports made from bamboo. Green beans, black eyed peas, kidney beans, 12′ Lima beans, and some peas, early, since they come and go fast. Dylan wants us to grow some black turtle beans, and I ordered seeds for them and they are also heirloom, so we can save seeds from them. So, Eliza likes purple and the seeds she has coming are for purple tomatoes and purple jalapenos. There’s enough space in the pot to plant them when she gets them. Growing them will be an interesting experience too. East facing early morning sun plus a few hours of grow light each evening should get these things all started, and the pot is big enough for all of them to grow to the right size to plant out. I have restrictions on what I can do this year after recent rotator cuff surgery. The surgeon just gave me a look when I mentioned being a gardener. Then he told me my gardening restrictions. I’ll follow those directions and still find ways to have good food grow in my fertile soil, and we’ll harvest all sorts of good things. I have collards laid out of the freezer for supper, grown last year, cleaned, cooked and frozen, and they taste almost as good as if I had picked them this morning. Saute them with some Rotel and add some shaved Parmesan, oh yea, makes me want to grow a garden, but then I always want to grow a garden. Regular readers, you knew it wouldn’t be long till I started talking about gardening……grow on, if you’re a gardener too! Yes, it is time to start growing. Last year a community garden was started in my neighborhood. The garden area has a big fence around it and a gate to enter to keep out the deer! Thanks Jackie. There will be a lot more of them coming, even with restrictions, my garden will grow!